Gosh - I didn't realize it had been so long since I posted! Where does the time go. A while back Mr. 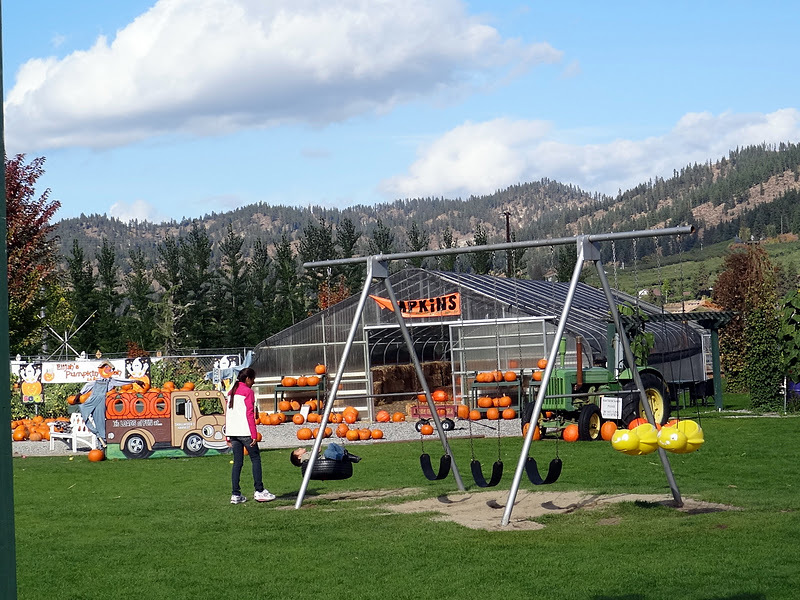 Squash and I went to Leavenworth, Washington for a little Autumn getaway! I thought you might enjoy seeing some of the places we stopped. 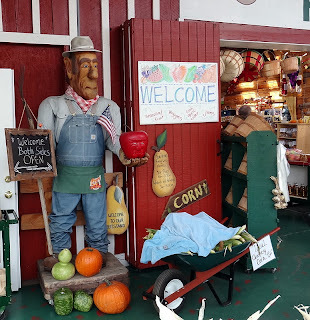 This is Prey's Fruit Barn - a longtime staple in the area. They always have so many beautiful baskets of flowers out front! This odd looking fellow greets you at the door. I picked up some packages of dried 13-bean mix for soups here and a few apples. We'd never seen this variety before - and they were HUGE! One apple could have served 4 people! It wasn't the best we'd ever tasted, but it's always fun to try a new variety. Click on the photo for the name. 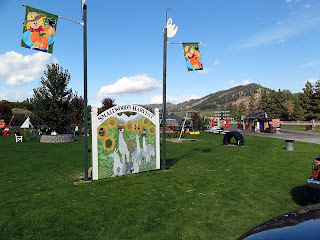 Next stop was another longtime institution - Smallwoods. 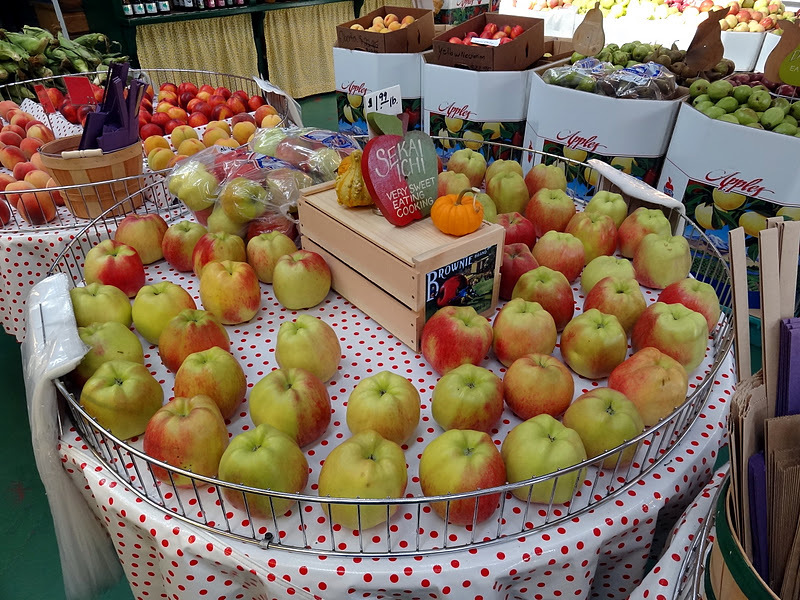 They have all sorts of fruits and vegetables from local farms and orchards, a petting zoo and fun things for kids to do! 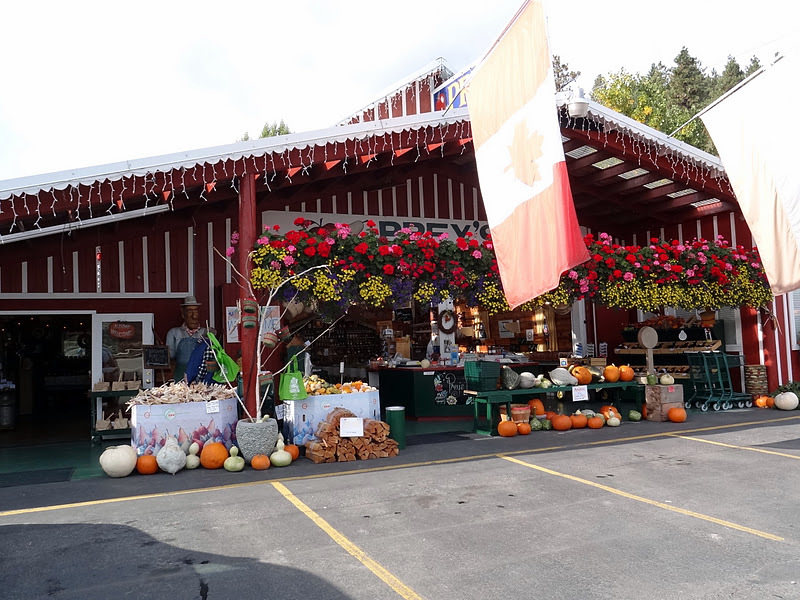 Here is where they had their pumpkins for sale. I wish mine were orange, but alas, they're still green and we just had our first frost. Needless to say, I picked up some that are orange! They had cute little vignettes all over! Mr. Squash wants you to meet his new friend - he's great to talk with - never argues and always agrees with what he says! This was adorable - a cow train for kids! 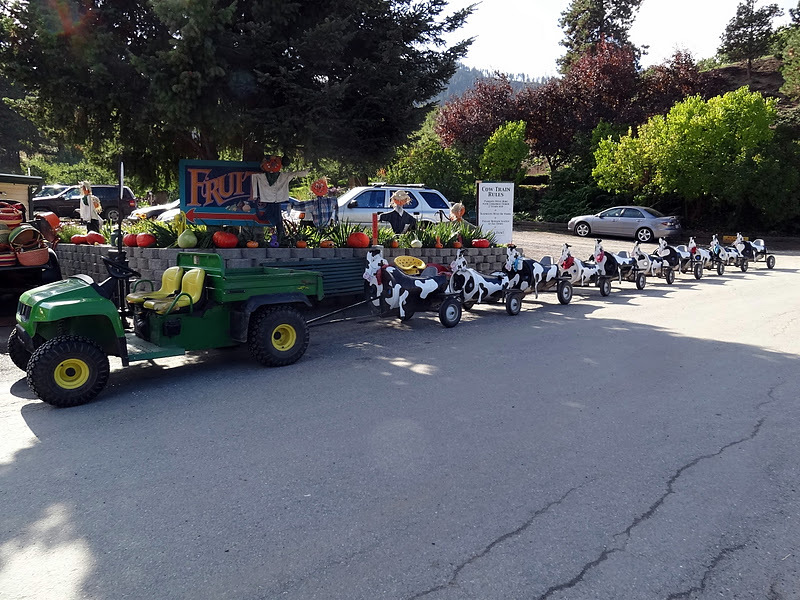 A few minutes after I snapped this photo, it was filled with little ones going for a ride around the farm! 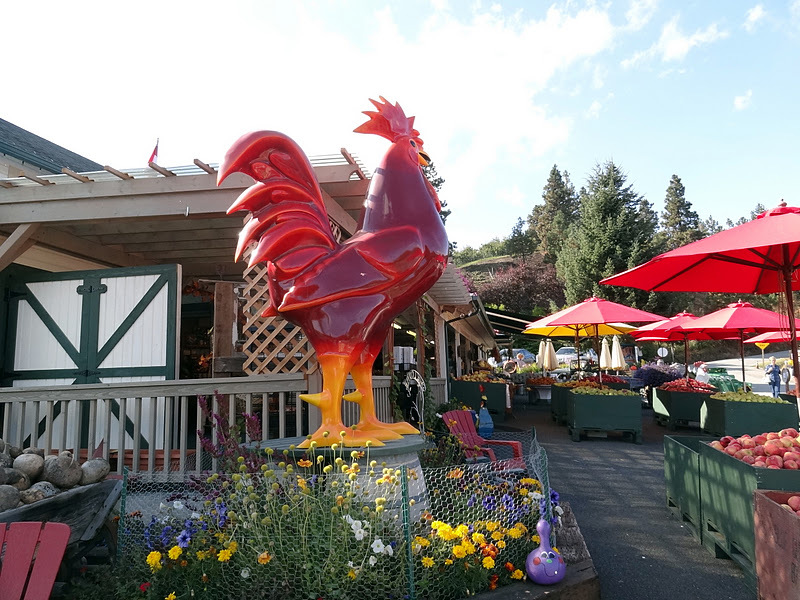 Don't you just love this huge, red rooster! 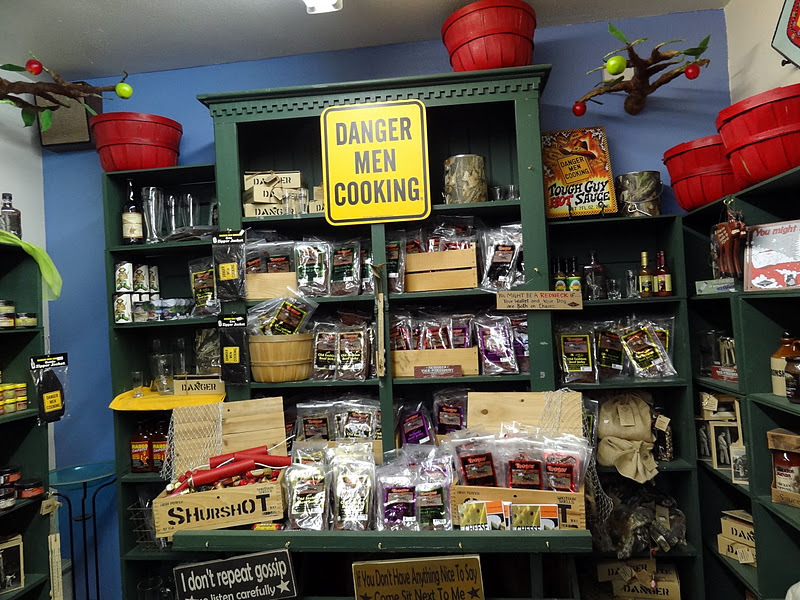 Check out this corner of their store - I actually know some very good men cooks - I think they have it all wrong! 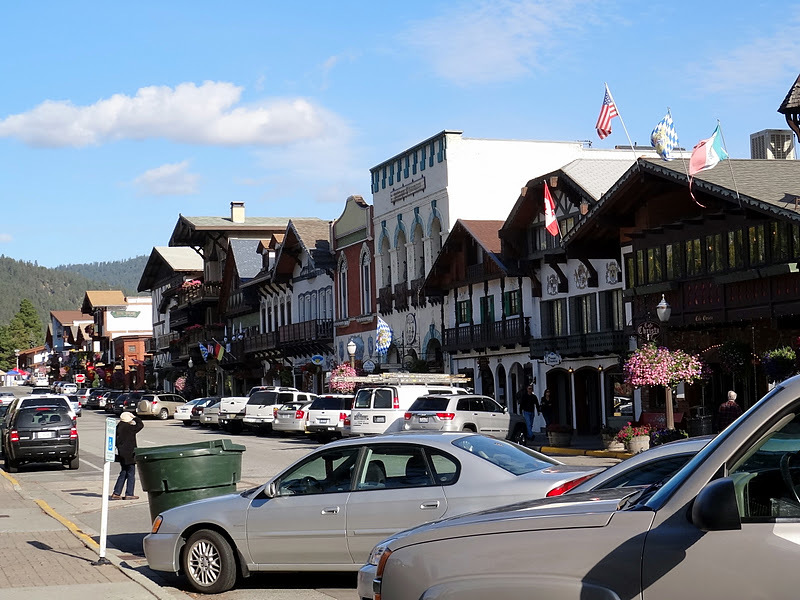 This is the main street in Leavenworth. All the buildings are made to look like you're in a Bavarian Village - it's what attracts everyone. They even play Bavarian music on loudspeakers all over town! We had a lovely trip and the weather was perfect! 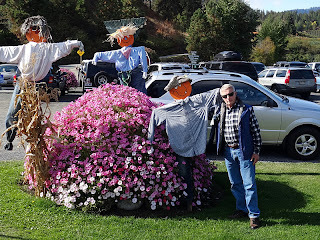 On the way home we stopped at one of our favorite nurseries. Mr. Squash saw this flag and knew it was perfect for the Squash House! Every time a group of kids walk past the house we hear all sorts of comments about how cool it is! Now if I could just get the wrinkles out! I'm so afraid to iron it and have it melt! 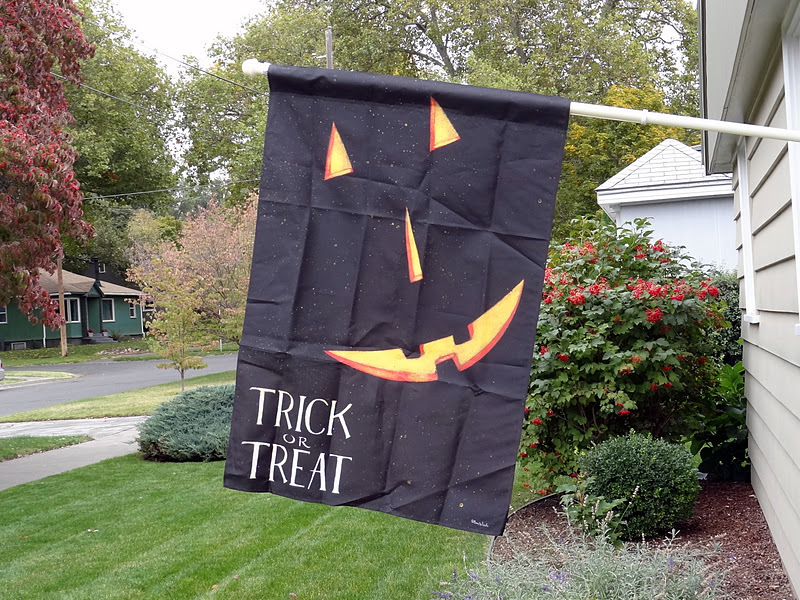 **EDIT** - Thanks to a tip from Kaaren - I've gotten the wrinkles out of my flag - it now looks terrific! Thanks, Kaaren! Looks like a fun trip. Very Americana! From looking at the skies in your beautiful photos looks like the weather was perfect! How about hanging your flag in the bathroom while having a steamy shower? Hot steamy showers don't take the wrinkles out of our skin (darn it) but it's worked on clothes. What a great day - lots of fun stuff to look at and nice weather to boot! I L-O-V-E outings like these. It's so much fun, especially at this time of year when everything looks so fresh and yummy. 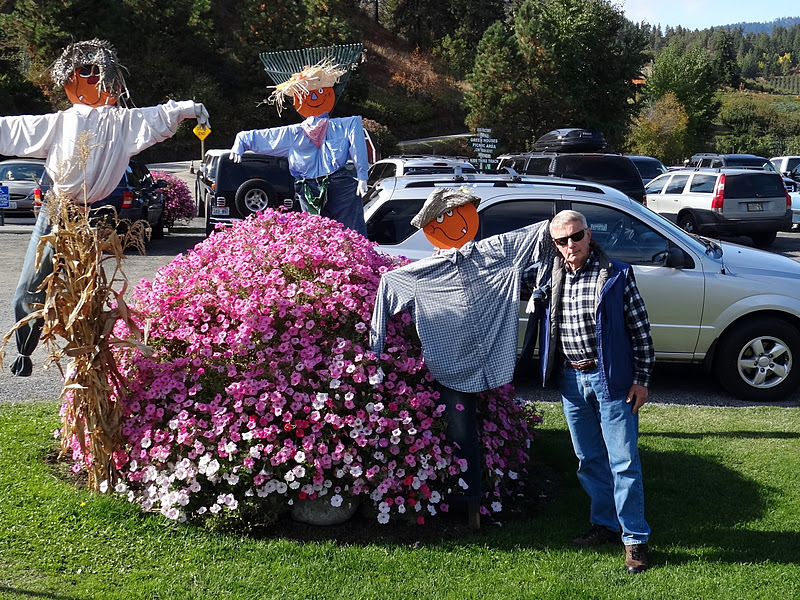 Did Bob and his new friend have a beer together...or maybe some apple cider? Hee! Leavonworth is an amazing town to visit. Glad you enjoyed your trip. Could you spray your banner with some water and tumble it for a few minutes? Or a low iron? i seriously want that rooster!!! What an awesome getaway! It looks like you had the most perfect fall weather! I really like Mr. Squash's new friend...I need one that can just listen while I b.....vent :-)once and a while. LOL! Thank you for the tour! 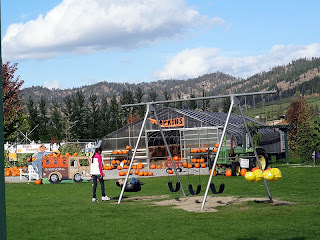 Pumpkins seem to be really important for your autumn, and they do look nice. - Quiet friends are so nice sometimes. Gorgeous pictures! Thank you for taking us along on your trip. 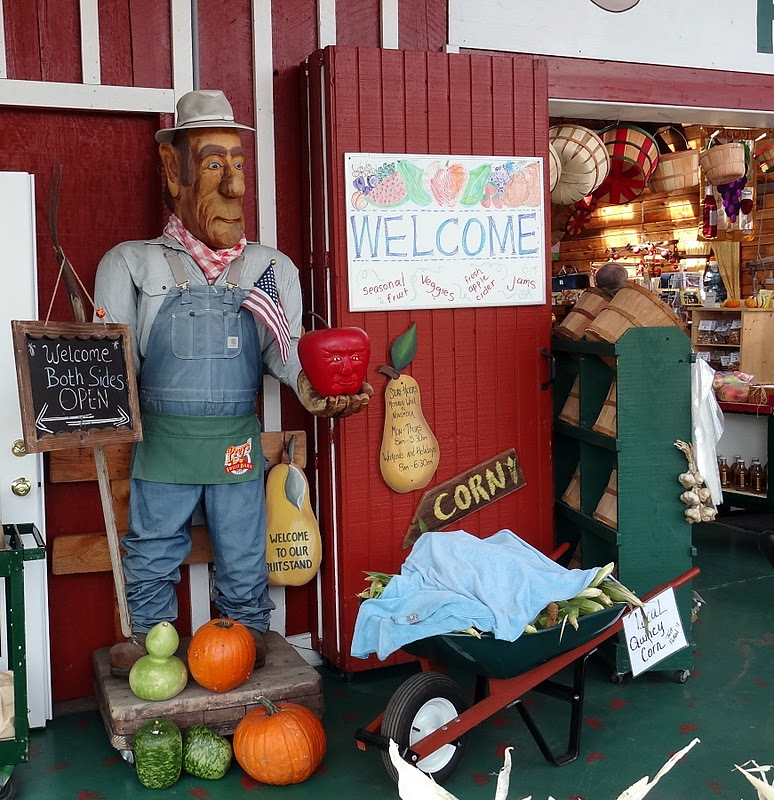 The displays of pumpkins with figurines are so cute! 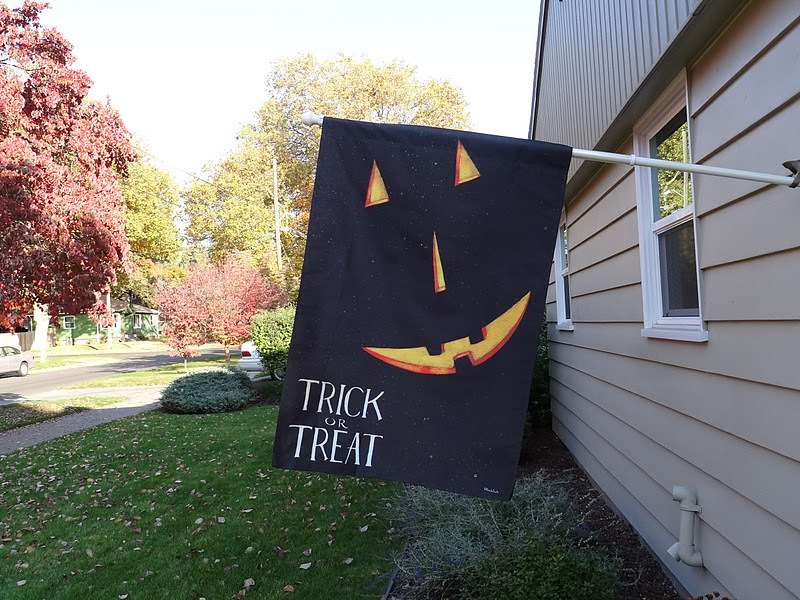 Yes, that flag is perfect. I do like that giant rooster. Beautiful country. 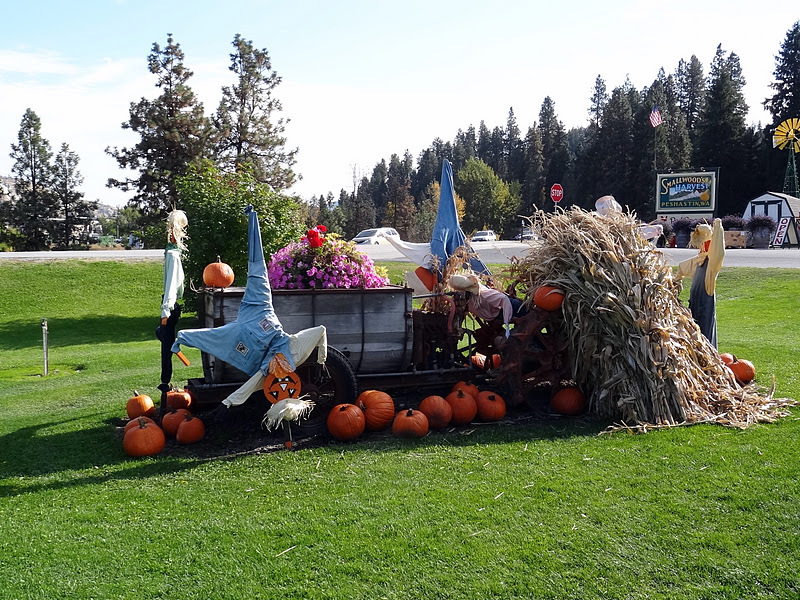 Oh, don't you just LOVE Leavenworth in the Fall?! I grew up camping there almost every weekend for many years as a teenager...many fond memories there and up on the Icicle River...have you fished the Icicle? Of course, since the road washed out at Ida Creek, some of the best fishing up there is inaccessable...for now thanks for sharing your pictures!